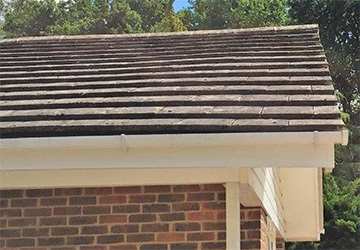 Here at A P Benson Roofing & Building, we have been servicing our Chobham clients with soffits and fascias, flat roof repairs, chimney repairs, and more for over three decades. As one of the finest roofing companies in the Chobham area, you can have complete peace of mind knowing that our team will deliver a first-rate roofing job for you, be it a minor repair or a full roof system installation. 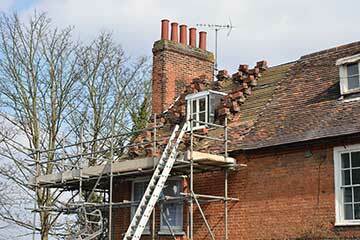 A significant part of our work in Chobham revolves around roof repairs. Our team of roofers can handle all manner of minor and major roof repairs, from missing slates to heavy storm damage. 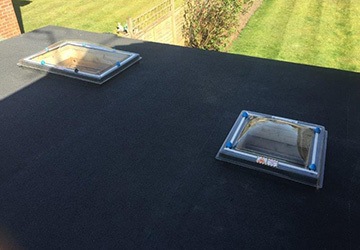 While flat roofs can bring their own collection of issues when it comes to maintenance, the team at A P Benson Roofing & Building are more than equal to the task. We pride ourselves that our skill with flat roofs matches that with pitched roofs. Whether in active use or merely decorative, we can provide a range of chimney repairs, no matter what the extent of the damage is. Soffits and fascias run the length of a property and are essential in helping support the weight of your eaves and guttering. Our team of roofers are well-trained in the installation, replacement, and repair of soffits and fascias, leaving you with a safe and secure support for your roof. In addition to pitched and flat roof repairs, soffits and fascias, and chimney repairs, we also deliver new roof installations, guttering repairs and cleaning, moss removal, flashing and lead work repair, Velux roof window replaced and fitted, house and chimney re-pointing, Garden walls and patios laid. We are based in Guildford, from where we deliver our roofing services across most of Surrey. This includes our clients in nearby Woking, Godalming, Farnham and, of course, Chobham. Continuously trading for almost forty years, A P Benson Roofing & Building leaves other roofing companies standing, when it comes to quality and excellence of service. This is due, in part, to the expertise of our roofers. With over a century of experience in the roofing trade between them, they ensure that our Chobham customers receive a first-rate job every time.